As some of you may know, I have been struggling with gluten the past few months. Initially my doctor thought it was a lactose intolerance, but it was SO gluten that was causing my stomach to feel gassy and down right horrible. I received a package of products from The Healthy Shopper and while it took a while for me to write this post, it provided me ample time to sample the variety of items that I received. 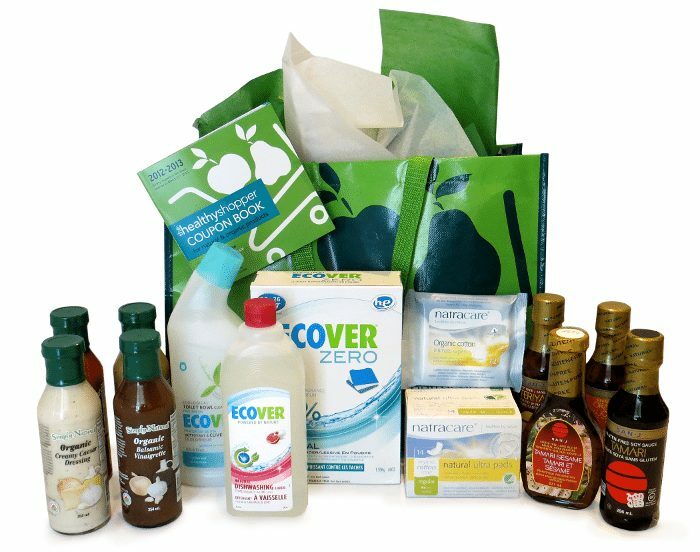 The Healthy Shopper is the first and only free coupon book in Canada for natural and organic products. In 1999, The Healthy Shopper was created by Randy Boyer and Andrea Donsky to encourage more Canadians to pursue and maintain a naturally healthy lifestyle while helping them save money. Natural and organic products can be more expensive, but The Healthy Shopper coupon book enables consumers to buy high-quality natural and organic products at more affordable prices, thereby providing a wide range of healthy alternatives. Over the years, thousands of consumers have sent them e-mails, letters and faxes telling them just how much they love and appreciate The Healthy Shopper™ coupon book. By far, the number-one thing they hear from consumers is that they really appreciate that the coupon book has introduced them to new products and made it affordable to try new products that they would never have otherwise purchased. TheHealthyShopper.ca is an extension of the coupon book. With e-coupons, product information, product reviews, tips and advice on how to live a more natural lifestyle, TheHealthyShopper.ca has become a trusted source for information regarding natural and organic products and great savings. To be honest, the products I loved the most was the Ecover laundry detergent and dishwashing soap, which is made from Sugar Cane. Knowing that they do not consist of harsh chemicals and the fact that they cleaned effectively was a huge factor in selecting these products as my favourite. The Simply Natural organic gluten-free salad dressings were very good. I don’t think there is one that we disliked out of the selection that we were provided. We are big salad eaters, therefore, I can imagine sticking to these products because they are reasonably priced, they taste great, and they are a great addition to my gluten intolerance “Like” list. But here comes the bittersweet part of my post. Like many other gluten-free products that I have taste tested, I did not enjoy the San-J Gluten Free Soy Sauce Tamari. Unfortunately, the flavour is quite different than regular Soy Sauce. I still use it occasionally but I’m limiting my stir-fry and rice nights drastically. I know that I have to learn to eat and enjoy gluten free products in order to avoid having attacks, but honestly, I will select other food options to avoid things I do not enjoy. It is so important to encourage healthy living to your family because as we age we feel the repercussions. I wish that my generation was brought up learning more about these products and were afforded the luxury to acquire a taste for them at an early age. I know that my journey will be a difficult one because of my food preferences. I’m hoping that The Healthy Shopper will assist me in finding products that I will enjoy through this journey of healthy eating the gluten-free way.